Ciaran Leahy scores twice as Inch United claim victory against Lismore A.F.C..
Ciaran Leahy moves to top scorer in this competition after scoring twice in this game taking the player's total scores to 10 goals. Ciaran Leahy has scored in the last 3 consecutive games. Cappoquin Railway F.C. beaten by Lismore A.F.C..
Cappoquin Railway F.C. have yet to win at home. Cappoquin Railway F.C. despatch Ballymac F.C..
Cappoquin Railway F.C. has yet to be beaten in this competition, having won 9 out of its last 11 games. Ardmore A.F.C. are defeated by Clashmore Ramblers F.C. 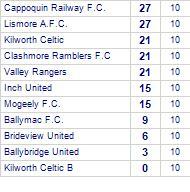 Clashmore Ramblers F.C are currently on a winning streak of 6 games. Cappoquin Railway F.C. claim victory against Mogeely F.C..
Cappoquin Railway F.C. are currently on a winning streak of 7 games.They have won 3 out of 4 home games. 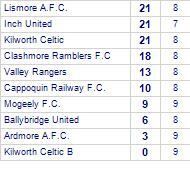 Kilworth Celtic claim victory against Lismore A.F.C..
Kilworth Celtic have lost 6 out of 7 home games. 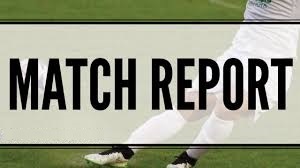 Ballybridge United are defeated by Clashmore Ramblers F.C. Ballybridge United are currently on a losing streak of 7 games.They have lost 6 out of 7 home games. Clashmore Ramblers F.C have won 4 out of 5 away games. Inch United beaten by Lismore A.F.C..
Lismore A.F.C. are currently on a winning streak of 8 games.They have won 6 out of 7 away games. Lismore started the better team and dominated the early exchanges and were rewarded in the ninth minute when Kevin O'Neill scored from a free kick 20yards out after David Skeehan was fouled. Lismore were good value for the lead and while Cobh came more into the game as the half wore on the home side deserved to be in front at the break. Cobh upped the tempo in the second half and were on top early on but Lismore soon found there way again and were a constant threat with Bennett up front and Skeehan and Scanlon in midfield playing some fine football. Cobh threatened as the game entered the final quarter but never really created a clear cut chance as the Lismore defence held firm for a deserved cleansheet. Well Done to Lismore who will play away against Corinthian Boys or Castlelack in the 3rd Round.